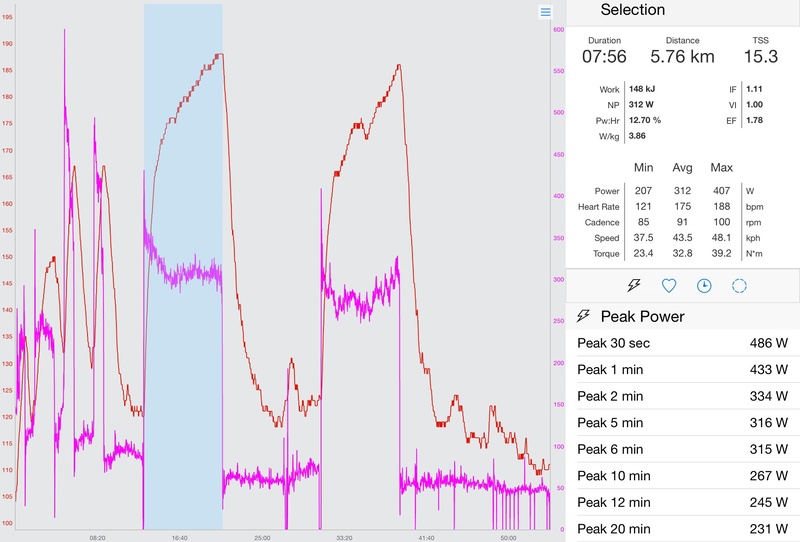 According to The Time Crunched Cyclist training plan, in order to train as effectively as possible one needs to determine at what intensity to train. For me this was one of the big motivators for starting this training plan – were all those hours I as spending out on my bike having the effect I was hoping for? Should I be going harder, or was I overtraining? (OK, so overtraining was quite unlikely, but in fact, not eating enough was quite likely). To determine training intensities, you do a field test. This consists of a warmup followed by two all-out 8-minute sessions. The idea is that the field test is a standardised way of determining your fitness and training zones. You do a field test before you start an 11-week training block. Here are the results of my first field test which I did a couple of weeks ago. The graphs are from the TrainingPeaks iPad app. You can see the warmup at the start (which includes a couple of sprints) followed by two 8 minute sessions. You can see that during the 8 minute sessions my heart rate steadily increased. If I was training with a constant heart rate, I would have had to reduce the power to keep my heart rate constant. I also reckon I went off a bit too strong in the first session – the advice is to increase the power over 30-45s and then maintain this for 8 minutes. The average power for the first session was highest, so I’ll use that as my Field test result – 312W. From this number you then derive your training intensities, the most important of which are shown below. Endurance Miles (184W). This is where you spend the majority of your training. Subjectively, it feels about where I ride at if I’m going on a 3-4 hour ride with friends. Steady State (274W). This is for intervals of 6-12 mins in duration. It’s fairly tough, but not impossible. RPE (rating of perceived exertion) about 7/10. Power Intervals (315W-plus). This is for intervals of 1-2 mins in duration. I feel like I’m nearing an untimely demise at the end of these intervals. So have I been able to stick to the routine, or crashed and burned? Find out in my next post.